Tyler Nicely Becomes first 2 time Winner of Merrill Downey! Owensboro, Kentucky native, Tyler Nicely became the first 2 time winner of The Merrill Downey Memorial on Saturday night at The Lawrenceburg Speedway. He did so in dominating fashion leading all 44 laps for the seventh running of the event. 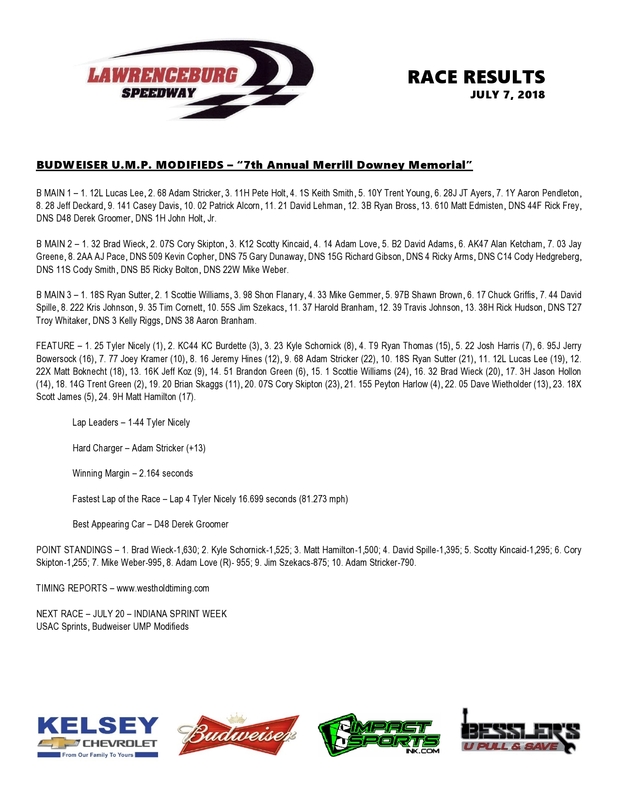 66 Budweiser UMP Modifieds were on hand which tied the record for most cars which was set back in 2013. The 66 cars were broken down into 3 groups for qualifying with Adam Stricker, Jerry Bowersock, and Ryan Thomas setting the quick times in their respective groups. From the 3 groups, 6 heat races were lined up where the top 3 transferred to the 44 lap feature. 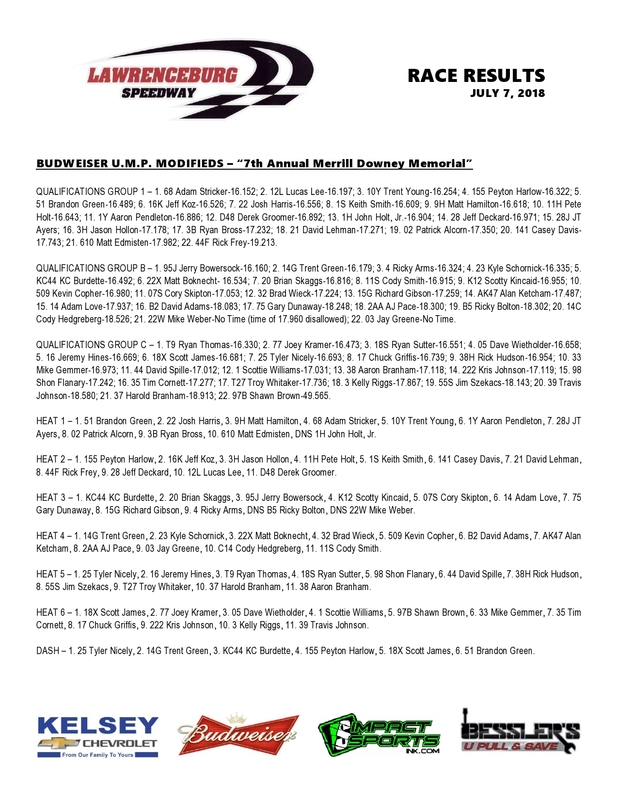 3 B-Mains where the top 2 from each made up the entire 24 car feature field. The Heat race winners squared off in a 6 lap dash to determine the starting lineup for the first 3 rows with Nicely winning the dash. At the drop of the green flag, Nicely secured the lead but Trent Green was putting pressure on Nicely for much of the race. As Nicely led up front, Green, KC Burdette, and Kyle Schornick battled hard for the runner up spot. On a late restart, Green had a run on the high side of Nicely but ran out of race track and hit the wall on the backstretch damaging his right front and eliminating him from competition. KC Burdette would briefly challenge Nicely, but could never make the move. Nicely’s win awarded him a total of $7,380 plus an additional $444.44 for winning the fast car dash. KC Burdette finished second followed by Kyle Schornick, Ryan Thomas and Josh Harris. B Main winners were Lucas Lee, Brad Weick, and Ryan Sutter. Heat race winners were Brandon Green, Peyton Harlow, KC Burdette, Trent Green, Tyler Nicely, and Scott James. The Budweiser UMP Modifieds return to the track on July 21st as the support class for USAC Indiana Sprint Week. 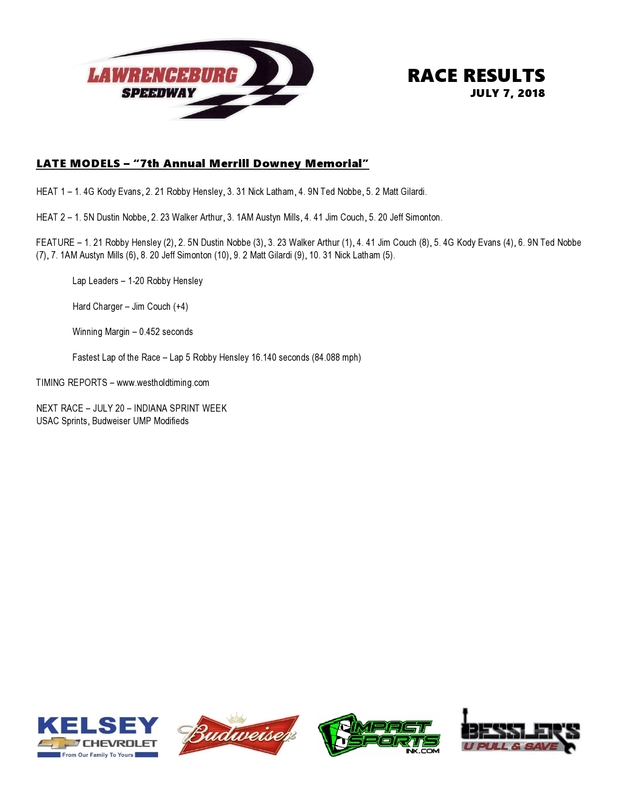 Hensley Wins Late Model Feature! The Big Show Robbie Hensley led all 20 laps on his way to picking up the feature win in the lone Late Model race of the year at Lawrenceburg. Walker Arthur applied pressure for most of the race but could never make the pass on Hensley. Dustin Nobbe got around Arthur and made a challenge on Hensley but jumped the cushion in turn 3 with 2 laps to go ending his hopes at a victory. Arthur finished third followed by Jim Couch and Kody Evans. Heat race winners were Evans and Dustin Nobbe.